Looking for a Park Model Trailer, RV, or 5th Wheel? This is our 10th year operating these snowbird sites! We get hundreds of visitors every day to our sites. They are virtually all snowbirds (or 'wanna be') looking for a park and/or a park model to rent or buy. You have the option for your ad to appear on the site for up to six (6) or twelve (12) months, unless you request we remove it. You may send us as many changes to the ad as you wish for as long as it is on the site. This allows you to change the available months when part of the season is rented. Up to six (6) pictures may be uploaded to your ad. Click on the button and follow the instructions on the ad form. The ad will appear as soon as we approve it. We will contact you if there are any problems. We will invoice you for payment by credit card or PayPal. . If you have any problems or would like us to place the ad for you just let us know. A note about picture size. Pictures can be any dimension but if they exceed 1 MB in size then you may have a problem loading. If your pictures don't load properly then resize them or email them to us to do that for you. We are providing the opportunity for you to advertise your park model on the site until it is sold or for one year, whichever comes first. Hopefully it won't take a year but there are many examples of listings taking a long time to find that right buyer. You can send us changes any time while the ad is running. Your ad will appear on the site for up to twelve (12) months unless it is sold or removed by you. You may send us as many changes to the ad as you wish for as long as it is on the site. If the park model is being rented while advertised for sale you can also place an ad in the rental section at no additional cost. We will invoice you for payment by credit card or PayPal. A note about picture size. The smaller the picture format the better. Especially if you are loading more than a couple pictures. If your pictures don't load properly then resize them or email them to us to do that for you. We have searched for sources of good information related to Park Model trailers and also have added some advice and tips we have gleaned from the 'more experienced'. We realize that many readers will already have considerable knowledge and experience with their trailers. But we also need to provide information on the assumption that you are a new owner and wondering what to do next. To those who already have a lot of experience with their Park Model we would love to hear from you with any advice and tips you feel would help others less experienced. "Once we bought our park model trailer it was then a challenge to figure out (both) what we had and how to look after it. We found information was lacking and not that easy to find on the web. The process started with a plumbing leak, a swamp cooler that didn't do anything, and a furnace that didn't light. Good neighbors, the local hardware store, and some experimentation helped solve the problems." Good information on park models is not easy to find. There are plenty of sources for the traveling RVs and the standard house trailers but little specifically related to park models. applies to any home structure. We also found some experienced owners of park models who were only too willing to share their knowledge and experience. We are most grateful for their advice and have included some of that information in this section. We will be adding information as it is available. Information is being collected from; a lifelong trailer owner who has 'done it all'; an experienced buyer/seller of park model homes; and, we will share any of our own experiences and those of others we hear from. But there is no intent to 'reinvent the wheel'. There are many good professionals who provide good information on their sites and we do not intend to compete with their experience and knowledge. Mobile Home Repair Mark at the Mobile Home Repair site has years of experience in doing repairs and remodeling and provides lots of information on a variety of topics related to trailers. He has published a book on mobile home repairs, operates a park, and has been a trailer dealer. 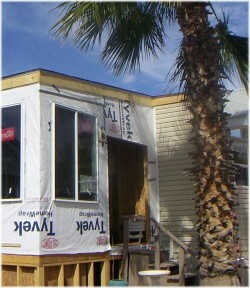 Included on this site is a forum for discussion of mobile home issues. This is a site (rd.com) by the Readers Digest that provides the opportunity to search specific home repair items. Many of those are applicable to Park Model Trailers. The links provided in this section are only suggested as potential sources of information. There is no recommendation suggested or implied regarding these suppliers and/or information sources. Most of us are used to house maintenance in a very different climate. And we probably have no experience with leaving a residence to sit for many months. There are some things to keep in mind. When preparing your trailer to sit in the summer heat of Arizona it is important to know some basics. Your trailer will not have much ventilation and it could become pretty hot in there. The climate is extremely dry so you need to consider adding some moisture to the air by providing some evaporation. half full so 3 gallons of water had evaporated. 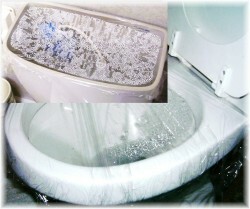 plastic wrapso as not to allow evaporation from the bowl and even the tank. It is important to seal off all drain openings. Make sure to include all sinks and the bathtub or shower. quite creative. One method is to cover the plastic bags filled with water. 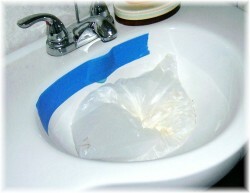 The bags then take the form of the surface where the drain opening is. Make sure to use sturdy bags and that they are 100% sealed. We had a couple fail due to careless sealing of the opening. Use tape to seal the overflows. To be safe you may want to use a better quality moisture - proof tape than the painters tape used here. Wherever possible, windows should be covered to prevent sun damage and reduce internal heat. 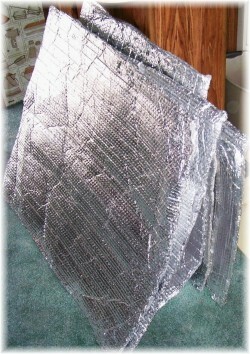 Many trailer owners have cut aluminum insulation sheets to fit each window and place them inside the curtains or blinds, or between the window and screen. A variety of window coverings are seen in the parks come summer. Some simply use cardboard, some appear to be thin plywood. Some trailers with awnings will lower and secure them. But probably the most common are those aluminum sheets cut to fit each each window and the patio door. They are quite durable and can be used year after year. And of course power and water supply lines should be shut off. Shut off power at both your internal breaker and the outside main breaker. Shut furnace thermostat and water heater off. 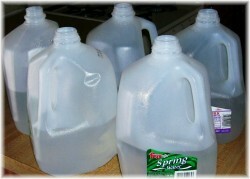 Some people advise leaving water in the lines to help protect the plastic lines from drying out and plugging. And when you return it is suggested that you open some taps before turning the water back on and run the hot water for about ten minutes to clean out the hot water tank. open the doors to keep air circulating. bath drains and flush with hot water. Remove batteries from smoke alarms, clocks, and remotes. Weeds should be sprayed around the trailer. They can grow quite well over the summer and most parks will charge you for dealing with them. Termites are another issue in Arizona. Those of us not familiar with these little pests are certainly in for a lesson in determination and (unfortunately) some destruction. It may be a good idea to call in an exterminator to have your unit checked and sprayed. You can buy termite sprays and do some work yourself but be sure to read the instructions for dealing with these critters. We are told that you can kill termites that are there but to prevent them at all you need to dig trenches or holes in the ground and then soak the ground under the surface. That's where they will come from. And don't store anything under that trailer unless it is sealed in plastic. That good 2x4 you are saving will be a real attraction. Arizona does get some good winds and they tend to come in the summer 'monsoon' season. Your trailer can be quite vulnerable so you need to take a walk around to examine anything that could be caught by a good wind. Awnings should be secured down and various trim and other items checked for their security. Also check yard ornaments and outside furniture. Ants are another concern. As with other issues, things can happen over time when no one is around for maybe seven or even nine months. 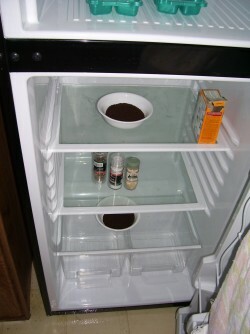 Get some ants appearing in your home and you usually catch things before they get out of hand. But when no one is around to 'catch things' they can/will get out of hand. If you care about utility bills and about the environment then don't discount the Swamp Cooler. Swamp coolers use water evaporation to provide cooling that is then blown by fan throughout the trailer. They are only effective only in hot dry weather. Certainly a reasonable cooling alternative for the desert areas. blowing yourself with a fan. The rapid evaporation of the moisture provides considerable cooling effects". Swamp coolers became quite out of fashion and almost suggest 'old'. But there may now be some resurgence. 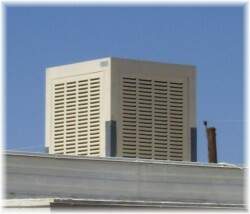 They can be more economical to operate than air conditioners and will save on energy. They require some regular maintenance but do seem to be quite an affordable means to provide some relief from the heat in earlier fall and later spring.